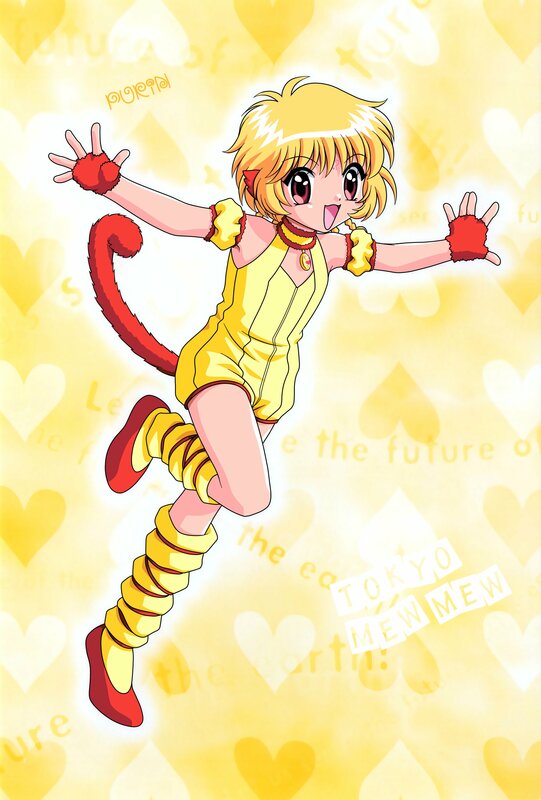 Pudding Fong (alternatively, Bu-Ling Huang or Purin Fon) is the fourth and youngest Mew in Tokyo Mew Mew. She is infused with the endangered Golden Lion Tamarin and her Mew form is called Mew Pudding. She is 10 years old (8 in the original manga and as old as 14 in some dubs) and enjoys performing acrobatic feats when not working at Café Mew Mew. She is the oldest child in a large family and the primary caregiver of her younger siblings after the death of her mother. The youngest and most hyperactive of the Mews, Pudding is often considered very immature by the other members of the team. She has many childish tendencies and often plays around when she should be serious. It is shown however, that she is quite responsible and mature as she takes care of all her younger siblings. It's mostly around the other Mews that she feels she's free to actually act like a child and let someone else take responsibility for once. Pudding is the smallest of the Mews and has large eyes to invoke an innocent appearance. She has naturally light blonde hair that is cut short and hugs her face. Her eyes are a shade of bright orange-y brown. To reflect her origins, most of the casual clothing she wears has a noticeable Chinese flair to it. Her café uniform consists of a yellow dress with brown trim, a white heart-shaped apron over top of it, and light yellow and white bows. She has black shoes with yellow laces, short yellow socks, and a lacy headband to hold her hair back. In her Mew form, Pudding's hair becomes a more golden shade of blonde and is tied into a few small braids at the back. Her eyes turn a lighter shade of orange. She wears a yellow jumpsuit that connects to her choker at the top and ends in a pair of shorts with brown trim on the bottom. Her shoes are brown flats and she wears yellow leg warmers with bits of brown string wrapped around them that extend almost to her knee. She wears fuzzy, brown fingerless gloves and has the standard choker, arm puffs, and garter in her signature yellow with brown trim. Her animal features are a pair of monkey ears and a fuzzy brown tail. Her weapon is the PuRing Rings (alternately called the Pudding Rings) which are two small rings modelled after tambourines. The larger outer ring is yellow tambourine complete with silver metal jingles that has the golden bow and Ichigo's Mew Mark heart on the side opposite of its grip. The smaller inner ring is simply brown with a single silver bell attacked to one end. Her attack is called "Ribbon PuRing Ring Inferno" and it traps her opponents in a clear pudding-like substance which makes it easy for the other Mews to finish them off. In Whiteweaver's fanfiction, Pudding has finally settled down into her 2nd year at middle school, and now wears her hair in two buns held in tied white cloth and a chrysanthemum on one side. Her father appears to be at home much more frequently and she is still apparently in contact with Tart. In Mew Mew Power: Apprentice, Pudding's name is changed to Kikki Benjamin. She is thirteen years old and serves as a secondary protagonist. She mentors a new Mew apprentice by the name of Kanya Morris, since her own Mew powers have been disappearing. Kikki is still an energetic young girl with a flair for acrobatics, but she's calmed down considerably over the years. Pudding is seemingly on vacation with the other Mews during the beginning of the story. The team later discovers that the Tokyo Mew Mews have been captured and are being held hostage by the aliens. They are later freed by Natasha and Kashi and Pudding aides in the final fight against Shinichi. During Mythical Mew Mew, Bu-Ling is around 22 years old. Pudding seems pretty determined about something! Pudding and Tart are meant to be!